The gang was all gathered at Paddy’s Pub preparing for the upcoming Super Bowl in which the Philadelphia Eagles were playing. Charlie closed the bar so that everyone could go to the Super Bowl party. Frank had selected people representing the true nature of Philadelphia and he had ordered a party bus for the group. The bus departed without Charlie and the gang was separated. The group quickly realized that Cricket had stuck onto the bus imitating Charlie. The Waitress, who was driving the bus, hit a pothole and caused the bus to stop on the side of the road. Frank had gotten injured by the bump. One of the other passengers inspected the bus and found that it would not be able to continue on its journey. Frank had gotten a private plane and a private box for the group. When they arrived at the Super Bowl, the group recognized that Dee had pink eye. During a break in the game, Frank and Mac went together to use the restroom. In the restroom Frank began to pass a kidney stone, but he resolved to go back to the private box and watch the game. Dee’s pink eye had now spread to both of her eyes. Mac sent Dee out of the box. 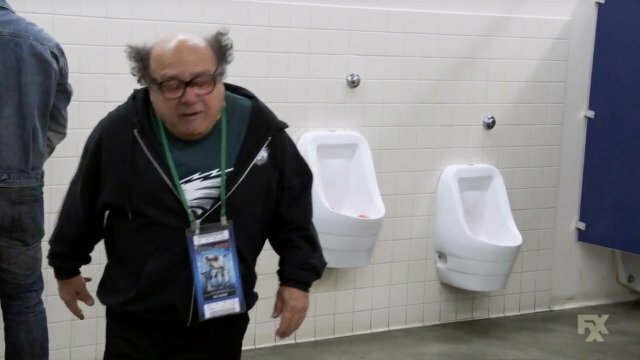 Mac took Frank to the restroom again as he found that every time Frank urinated the Eagles scored. Dee had put on a server apron and was allowed to go and help prepare the food. Dee accidentally walked into the laundry room and put her pink eye infection onto towels for the NFL teams. Mac got angry at Frank for his inability to pass the stone. Frank gave an impassioned speech defending the city of Philadelphia. Frank managed to finally pass his kidney stone and the Eagles won the game. Mac and Frank celebrated with the other attendees in the restroom and began to return to the private box. They returned to the private box and Mac apologized to all of his friends as they were true representations of the city of Philadelphia. Mac called Charlie and asked him to complete his rituals to ensure an Eagles win. Charlie did so and the Eagles were crowned Super Bowl Champions. All of the people in the private box celebrated as did the entire city of Philadelphia. 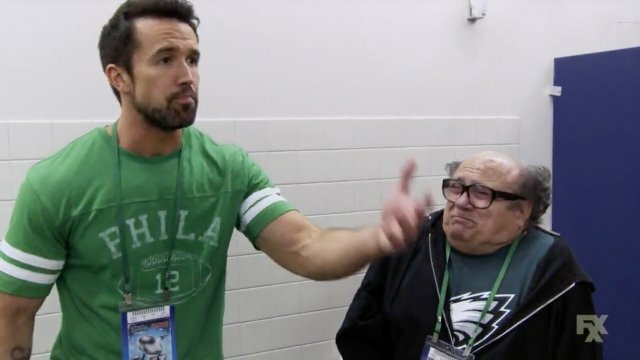 What did you think of It’s Always Sunny In Philadelphia season 13 episode 9? Let us know down in the comment section below! The post It’s Always Sunny In Philadelphia Season 13 Episode 9 Recap appeared first on ComingSoon.net.